Meng Yue’s challenging new book is in a sense shortchanged by its title. Although Shanghai and the Edges of Empires takes the city as its point of departure, it reimagines the entire history of Jiangnan during the Qing and early Republican era; and rather than confine itself to cultural margins, the book demonstrates the fundamental interconnectedness of “edges” and interiors in cultural spheres. Historians and literary scholars may find numerous individual points to take issue with, but the boldness with which this book stands conventional assumptions on their heads and the thoroughness with which it conceptualizes an alternate history of the interaction between Jiangnan cultural producers and European and American imperial projects make it necessary reading. Conventional discourse on the relationship between China and the West in nineteenth- and early twentieth-century Jiangnan frames this interaction in terms of imports (material and symbolic) through Shanghai. The paradigm of Western impact and Chinese response has constituted a deep structure that constrains even the scholarship that appears to criticize it. Meng Yue challenges this paradigm in three distinct arenas: scientific and philological knowledge, the entertainment world, and quasi-public spaces. In each case, she convincingly puts Shanghai in a broader Jiangnan context, argues for a deeper understanding of historical continuities, and presents Western colonialist activity in Shanghai from a strikingly different perspective. Instead of a simple force affecting a passive object in more or less predictable ways, Meng sees the confluence of a variety of distinct cultural, political, and economic trajectories in Shanghai. Shanghai and the Edges of Empires begins with an analysis of the city’s rise that has won over an increasing number of historians in the last decade: Shanghai’s economic and cultural development in the nineteenth and early twentieth centuries depended much more on internal changes in Qing society, and less on Western influence, than previously acknowledged. The city was not a fishing village prior to the Opium War, but rather a metropolis whose trade volume could even be compared with that of London. Over the course of the nineteenth century, Shanghai owed its further rise primarily to changes in the administration of the salt monopoly, a shift in grain transport from the Grand Canal to a sea route that involved transshipment in Shanghai, and, perhaps most significantly, the widespread devastation in Jiangnan resulting from the Taiping Rebellion and its suppression by the Qing. To a great extent the city benefited directly from the misfortunes endured by Yangzhou and Suzhou during this period. Meng builds on this approach and emphasizes the role of what she calls the FIRE-O economy–taking Janet Abu-Lughod’s argument for the importance of the finance, insurance, and real estate sectors in the development of American global cities and adding opium as a fourth item specific to Shanghai. Although the conventional image of Shanghai pairs manufacturing with trade as the primary sources of the city’s development, Meng demonstrates that real estate was a much more significant arena for the creation of value well into the early twentieth century. In addition, in contrast to the usual focus on industrialization and mechanical production as an index of modernity, Meng highlights the role of “massive semiotic exchanges” (32) in fields ranging from finance to publishing. Given this orientation, it is somewhat surprising that Shanghai and the Edges of Empires does not contain a more thorough discussion of the media industry in its role as producer of images and discourses that contributed significantly to the cultural construction of the city. Chapter 2 investigates the invention of “transcompilation” (bianyi) at the Commercial Press and details the variety of projects that the press undertook to position itself as a key player in semiotic exchanges between “China” and “the West,” but there is little attention to the contemporary semiotic circulation that was less directly tied to colonialist or anticolonialist projects. The emphasis on the Commercial Press and on publications such Dongfang zazhi , which self-consciously lay claim to the role of cultural intermediaries, reminds us that Meng’s aim is ultimately to map out the “cultural, political, and historical configurations of the globe” in which Shanghai is located, rather than focus in exclusively on the city (viii). To this end, when Meng turns to a central urban culture practice that she defines as “urban festivity,” she is concerned not only with tracing back its genealogy a century or more in the broader Jiangnan region, but also to contrast it implicitly and explicitly with the culture of consumption characteristic of London and Paris in the nineteenth centuries. Focusing on the “heat and density of activity” rather than on magnificent architecture (89), Meng’s aim is to identify an “urban festivity” that transcends the division between feudalism and commodification central to so many narratives of European economic development. Urban festivity in this reading cannot be disassociated from “unruly practices” (yin), whether in Gu Gongxie’s Suzhou (late eighteenth century) or Chi Zhicheng’s Shanghai (late nineteenth century). These practices, categorized either as “encouraging depravity” or “encouraging sedition,” have previously been seen as aspects of popular culture that the state attempte d to suppress. In this capacity the “unruly practices” have been understood primarily as a fragmented and antagonistic Other to the Cheng-Zhu ideological order and the bureaucratic system. Meng Yue’s contribution of Shanghai and the Edges of Empires is in reconceptualizing “unruly practices” as a source of cultural energy, controlled and managed by the Qing social order. As the state declined, they were set free to participate in a wide range of new cultural and political projects, a development that became increasingly noticeable in the second half of the nineteenth century. In Meng’s account, the cosmopolitan imperialism of the Qing in fact lived on in the “unruly” scholarly and cultural practices of Tongzhi and Guangxu-era Shanghai, and indeed reaches for more ambitious ideological goals as it gains unprecedented autonomy from the system under which unruly practices previously had to operate. This autonomy derives not from increased freedom of action in the areas under Western control, but rather from the unruly practitioners’ skill at working the seams between the different imperial(ist) regimes. This argument is developed most fully in the treatment of late-Qing theater, beginning with an inquiry into the link that certain Qing officials saw between inappropriate and unruly presentations on stage and the subsequent ease with which the Taiping Heavenly Kingdom managed to take control of the Jiangnan region. After the suppression of the Taiping forces, restoration of central government control was often followed by a crackdown on theaters, their managers, and the actors who performed there, making it clear that from the state’s point of view, theaters were fundamentally political enterprises, no matter how apolitical the subject matter presented on their stages might seem. Meng shows how many of these theater managers and actors took refuge in Shanghai, and proceeded to develop new “operas of the time” (xinxi) that posed more pointed and consistent ideological challenges to Qing authority. These “operas of the time” laid the foundation for the reformist theater that would follow in the ensuing decades; chapters 3 and 4 of Shanghai and the Edges of Empires make clear the close connections between the “unruly” theater managers of the early Guangxu era and writers and actors in the explicitly politicized anti-imperialist works of the late Guangxu and early Republican periods. It is precisely this genealogy of “unruliness” that was erased in May Fourth and later accounts of the development of progressive theater, which present the latter as an innovation without precedent or historical connection. Shanghai and the Edges of Empires similarly bridges the perceived gap between entertainment culture and committed political action in a discussion of public space in Shanghai (chapters 5 and 6). Bypassing the tired topic of the Public Garden–so beloved of later nationalists, anticolonialists, and defenders of the British empire alike, yet so unimportant to Shanghai residents at the time–this book investigates the public spaces that actually had significance to the great majority of Shanghai residents in the late Qing and early Republican period: parks like Zhang’s Garden and entertainment complexes like Great World. Like Antonia Finnane, Meng Yue is not convinced that Shanghai’s use of public space and its hybrid construction of transcultural exoticism were entirely new. Indeed, she sees Yangzhou as an important, though all too often unacknowledged, precedent, and frames her discussion of public spaces in Shanghai with an account of Yangzhou cosmopolitanism in imperial–even imperialist–terms, in explicit contrast with the more familiar narratives of British activity yet to come in Shanghai. With this background, it becomes much clearer that the “East/West hybridity” that we find in Shanghai is not only a result of Western traders and settlers arriving in the nineteenth century, but also a displaced continuation of tendencies fully in evidence in eighteenth-century Yangzhou. The mirror exoticisms of West and East–the former characteristic of the Qing empire from the eighteenth century to the beginning of the twentieth, and the latter of the British empire during this same period–find expression in miniature in Zhang’s and Hardoon’s Gardens. Zhang was an official with the China Merchant Steam Navigation Company, whose garden contained primarily European buildings and design elements; Hardoon was a real estate magnate of Middle Eastern origin and British citizen, whose garden emphasized Chinese and Japanese motifs. 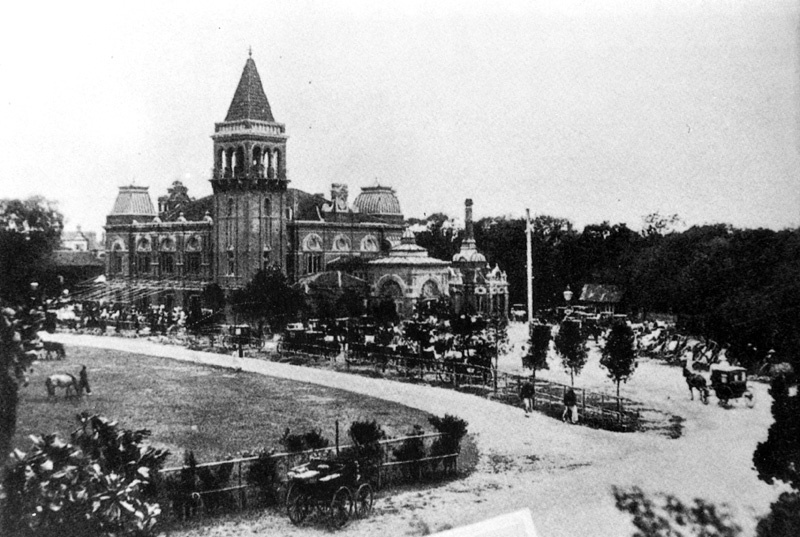 While Hardoon’s taste called British imperial aesthetic canons into question, Zhang’s Garden became one of the preeminent locations for public gatherings in Shanghai, especially for those of a “progressive” or political nature. Meng interprets the latter appropriation of Zhang’s garden (actually more of a park, when one considers the numbers of visitors and the scope of public entertainment offered) as evidence of a fundamental difference between the formation of the bourgeoisie in Europe and the experience of urban elites in Jiangnan. Whereas the European bourgeoisie emerged as a relatively dependable ally of the state, their Jiangnan counterparts were “submerged” and forced into opposition, their critique taking public shape in the very garden “interiors” that would have remained carefully isolated from public and political concerns in a European bourgeois society. Although a clearer explanation of the public character of Zhang’s Garden might lead one to question the characterization of that space as a “haven of upper-class tastes” (170), Meng’s point that the garden was a crucial location for political demonstrations in late-Qing Shanghai remains quite valuable. Shanghai and the Edges of Empires aims to read the city’s development between 1850 and 1930 in the context of Marxist and world-system theories, referencing the work of Kenneth Pomeranz, André Gunder Frank, and Dipesh Chakrabarty. The specific points made about Shanghai theaters, mathematical scholarship, and garden design serve for Meng Yue as elements of a much broader and yet-unrealized “history of noncapital,” an account of a set of historical processes that predate and subtend the limited and contingent development of capitalism. In Chakrabarty’s terminology, Meng sees herself as writing a “History 2” as opposed to the a “History 1” of capital, but it is a “History 2” that has the potential to join with other “History 2s” to present a different global metanarrative of economic, political, cultural and technological development. These “History 2s,” discrete narratives of noncapital, have specific moments of conjunction, such as the anticolonialist movement, but analytically belong together as parts of the global metanarrative, even at moments of relative dissimilarity and disconnection. If Marx’s theory of the Asiatic Mode of Production, according to Spivak, is an attempt to speak of difference as the same, or assimilate the exceptional case into his general theory of capitalism, Meng is working in a different mode, suggesting instead that a diverse set defined first by its exclusion from the normative theories of capitalist processes contains enough internal similarities at key moments to be theorized on its own terms, maintaining its resistance and even opposition to the dominant discourse. Studies of cultural production that make bold theoretical claims often shortchange the specific circumstances under which individual cultural producers work and do business. Shanghai and the Edges of Empires is unusual for a theoretical work in its attention to the telling detail: Zhang Shuhe’s plans for his garden are explained against the broader context of the China Merchant Steam Navigation Company’s attempt to challenge Western shipping hegemony; Luo Yiqing, founder of one of the earliest Shanghai theaters, was originally from Canton but had become a British citizen (and other theater managers had previously been affiliated with Taiping Heavenly Kingdom, worked as illicit arms dealers, and even personally offended the Empress Dowager); Huang Chujiu opened Great World together with the Mandarin Ducks and Butterflies author Sun Yusheng, and then went on to open a Day and Night Bank right next door. In each case, the added detail not only gives the reader a richer sense of the multifaceted lives of these cultural producers, but also of the complexity of the links between what might at first seem to be distinctly different arenas of activity in Shanghai, and in Jiangnan more generally. Shanghai and the Edges of Empires does not content itself with well-used scholarly paradigms, but seeks instead to forge new, often oppositional approaches. Inevitably, individual readers will encounter certain assertions that they would like to see more fully supported, lines of argument that they find unconvincing, and generalizations that appear to blur some of the distinctions that the author is careful to acknowledge in other contexts. For instance, the argument that urban elites in the late Qing and early Republican period experienced a “submergence” that gave rise to a critical public sphere rather than an “emergence” in the form of a national bourgeoisie is intriguing. Yet the thesis could have benefited from further substantiation in the form of indicators of decline or stagnation in economic power, political control, and social status. More generally, the emphasis on “nondiscriminative” ideologies among philological scholars, Taiping rebels, and Commercial Press transcompilers may leave one with the question whether in each case the challenged hierarchy was not soon replaced by a new hierarchy that brought with it its own particular blind spots and oppressive moments. But objections like these are to be expected to any work that directly questions the scholarly status quo; what is most important is that Shanghai and the Edges of Empires challenges us to begin a new and intriguing conversation about the cultural dynamics of nineteenth- and early twentieth-century Jiangnan in its global context.